A recent BBC news report claimed researchers found a clue that causes the male pattern baldness which more common among males. 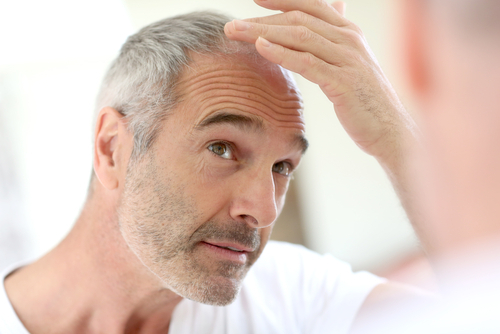 Most men start thinning their hair in the middle ages and 80 percent of all males see some hair loss in their 70s. Genetic factors as well as male hormone testosterone plays a major role in male pattern baldness. The male pattern baldness is not a medical disorder. However, it can affect your self-esteem or cause anxiety. Researchers at the University of Pennsylvania found that what genes are switched at what age causing hair to fall. The level of a key protein called prostaglandin D synthase is elevated in follicles in the bald area compared to non-bold areas of the scalp. In an experiment with mice, when they were fed with the protein, they went completely bald. Even when they were transplanted with human hair, it stopped growing. Researchers concluded that is due to the high level of prostaglandin D was present on the scalp. Researchers also identified several drugs including those that are in clinical trials that either can stop or reverse the male pattern baldness. So, a cure for male pattern baldness may be within our reach.